↑ अ आ "Swine influenza". The Merck Veterinary Manual. 2008. अभिगमन तिथि April 30, 2009. ↑ "Centers for Disease Control and Prevention > Key Facts about Swine Influenza (Swine Flu)". अभिगमन तिथि 27 अप्रैल 2009. ↑ Heinen PP (15 सितंबर 2003). "Swine influenza: a zoonosis". Veterinary Sciences Tomorrow. आइ॰एस॰एस॰एन॰ 1569-0830. 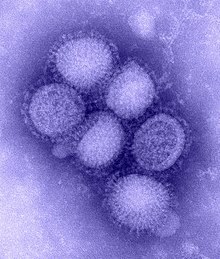 Influenza B and C viruses are almost exclusively isolated from man, although influenza C virus has also been isolated from pigs and influenza B has recently been isolated from seals. ↑ अ आ इ "Swine Influenza". Swine Diseases (Chest). Iowa State University College of Veterinary Medicine. ↑ Taubenberger JK, Morens DM (2006). "1918 Influenza: the mother of all pandemics". Emerg Infect Dis. 12 (1): 15–22. PMID 16494711. ↑ "U.S. pork groups urge hog farmers to reduce flu risk". Reuters. 26 अप्रैल 2009.